This Valentine's Day, if your sweetheart prefers gifts that are a bit more savory than sweet, then gift them these cool new Beef Jerky Roses from Say It With Beef instead. 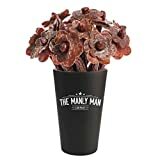 This fun and tasty Valentine's Day, Father's Day, Mother's Day, or any other day gift is a bouquet of long-stemmed roses or daisies made from over a half pound of 100% high-quality beef jerky beautifully arranged in either a beer mug or pint glass vase. Best of all, they will also never wilt and die and are without pesky thorns. Each bouquet includes a dozen beef jerky roses in either original, peppered, teriyaki, or mixed flavors.